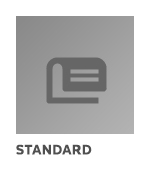 ISO 8501-1:2007 is a hardback A5-format book in four languages (English, French, German and Swedish), which specifies a series of rust grades and preparation grades of steel surfaces. The various grades are defined by written descriptions together with photographs that are representative examples within the tolerance for each grade as described in words. 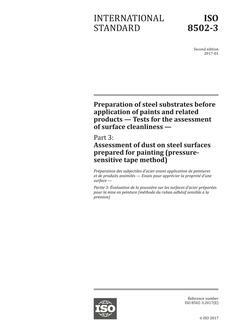 It is applicable to hot-rolled steel surfaces prepared for painting by methods such as blast-cleaning, hand and power tool cleaning and flame cleaning, although these methods rarely lead to comparable results. Essentially, these methods are intended for hot-rolled steel, but blast-cleaning methods, in particular, could also be used on cold-rolled steel of sufficient thickness to withstand any deformation caused by the impact of the abrasive or the effects of power tool cleaning. This part of ISO 8501 is applicable also to steel substrates that show residues of firmly adhering paint and other foreign matter in addition to residual mill scale.